← Former NYT Editor Jill Abramson: Getting back into journalism? Let us now praise Ben Bradlee. He has rightly been called the most courageous and consequential newspaper editor of the postwar period, and I would give him the whole 20th Century. During his 25+ years leading the Washington Post newsroom, Ben elevated the Post from the middle ranks of U.S. news institutions to the front ranks. He did it with nerve, imagination, and guts. If you think it’s easy to lead a couple hundred journalists, try it some time. Most days, you can’t get two or three to agree on anything, follow anyone, or admit that they couldn’t do any job better. It should also be noted that Ben transformed the Post with Katharine Graham’s money. It takes nothing away from Ben to observe that he was lucky in the timing of his career. He said as much himself. What made it the right time was that the Post was then gushing money, enjoying the heyday of all the big-city U.S. dailies that enjoyed a monopoly (or near monopoly). As I wrote in my book Covering America, the Post was poised for takeoff when Mrs. Graham took control of the Post in 1963. Though terrified of what she was getting into and almost entirely unprepared to lead a large enterprise, Kay Graham became president of the Washington Post Company in late 1963 and set about making her mark. In 1965 she brought Ben Bradlee over from Newsweek and made him managing editor of the Post. She helped him become a great editor, not only by supporting him professionally but also by presiding over a business that was practically printing money. These were boom years in Washington. Under Johnson, the Great Society programs were staffing up, bringing thousands of middle-class, white-collar jobs to the city and its increasingly far-flung suburbs. This was the target audience for the Post, and for every advertiser in the region. Money came rolling in. During the three years after Bradlee took over, the budget for the Post newsroom more than tripled, leaping from $2.25 million a year to almost $7.3 million. Bradlee got to add fifty new slots in the newsroom, and he went on a hiring spree. In the process, he transformed the paper, creating a star system (known famously at the Post as “creative tension”) in which reporters had to jockey for space in the paper and for favor in Bradlee’s inner circle. Imagine that: 50 new hires! And those were good jobs with good salaries and benefits. All those newbies were beholden to Ben, so he had most of them in his pocket. Plus, he managed to rid the newsroom of some holdovers who did not fit with his plans. In the end, he was able to build a giant new team of people who mainly loved him. Could he have been a great editor in another period? How would he have managed decline, cutbacks, and the diminished clout of the last 15 years at the Post? We’ll never know, of course. It’s entirely possible that he would have prevailed with his charm and his bravado. But without the budget to back it up, I have my doubts that even Ben could have made newspapering fun in the dreadful years. I did not know him well, but he was my boss for more than two years when I worked at the Washington Post near the end of Ben’s 25-year-run. (I say “Ben,” because that’s what everyone called him; we all called his boss “Mrs. Graham,” but he was always Ben.) I was a tiny asteroid in his universe, but I remember my few encounters with him vividly. You could not be around him and not want to be closer to him. You wanted to know that he knew your name, and you treasured his “attaboy”s and any kind of attention. For most of my career as a journalist, I wanted my editors to leave me alone. Not with Ben. Everyone has been telling Ben stories since his death on Tuesday, and I have been spending hours soaking them in. One good place to start is his own memoir, A Good Life — which is, as he might put it, a goddamn good book. It has many of Ben’s virtues: it’s unpretentious, it’s full of fun, and it doesn’t spend a moment feeling sorry for its subject. Here is a piece by Martha Sherrill, one of the many voices Ben promoted in the Post Style section that he invented (and which may be his second-largest legacy to U.S. journalism). Here is a tribute from David Remnick, who, as usual, is right on target. Here is BU Prof. David Carr’s smart, funny recollection. Here is Ben in his own wonderful voice talking with Terry Gross on “Fresh Air,” saying that journalists should be fair and honest and not back down (which just about sums it up). He also observes that anybody would have to have been “lobotomized” not to have pursued the Watergate story. Finally, here’s one photo of Ben (among so many — the man was ungodly handsome and photogenic) that I particularly enjoy. It shows him in August 1974 in the Post’s composing room, looking pensively at a “chase” of metal letters that newspapers still used in those days to create a negative image from which newspaper pages could be printed. That particular page says (in reverse) NIXON RESIGNS. 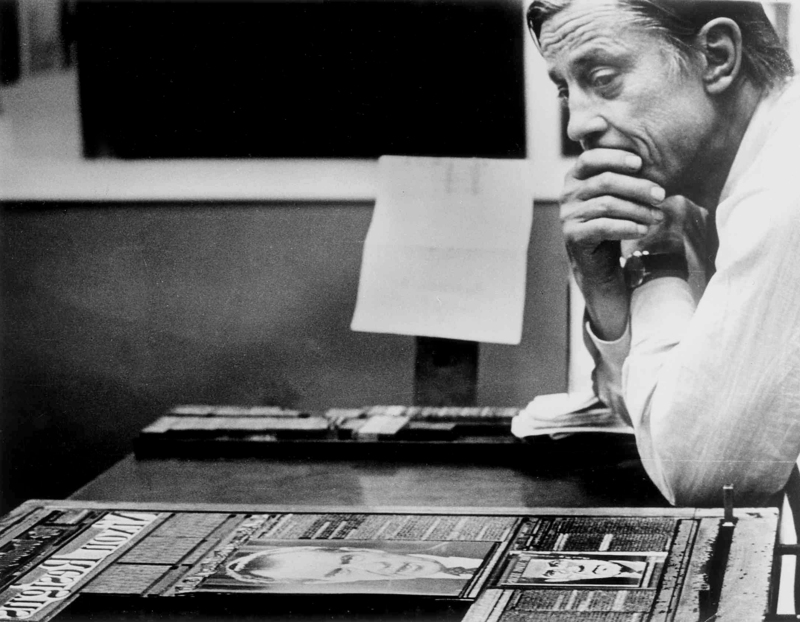 I like this photo because it reveals another side of Ben Bradlee, one that not everyone knew about. In that summer of 1974, when Ben knew that the end was near for Nixon after the Watergate scandals, he sent the word out through the newsroom: there was to be no gloating, no spiking the football, no champagne. He enjoyed a fight, and I believe he loved being in the arena, but he had the virtue and sense of decency that demanded good sportsmanship in the game of life. When I was in college, the Post hired a dozen reporting interns each summer. I made it down to the semifinal round of 24 but fell short of the final cut. Even in the days before Watergate, the Post was an exciting paper, as I knew from working for one of Bradlee’s proteges. One of my great regrets, naturally, is missing out on that big-time experience. He was one of the greats from the glory days of American journalism. Going from Katherine Graham to Rupert Murdoch tells you everything you need to know about the plight of newspapers. Bradlee. for all his considerable talent, was lucky about his era in another respect–when you read of his dating subordinates and calling grown reporters “kid”, you wonder if he could have lasted even a year in today’s environment.